Are you going on holiday to Thailand? You’ll definitely want to experience the amazing wildlife, including the elephants. Elephants features prominently in many Thai traditions and folk tales making it something of a national animal in Thailand. From the north of Thailand down to the south, elephants can be seen, both in their natural habitat of the jungles and busy urban spots and tourist areas. 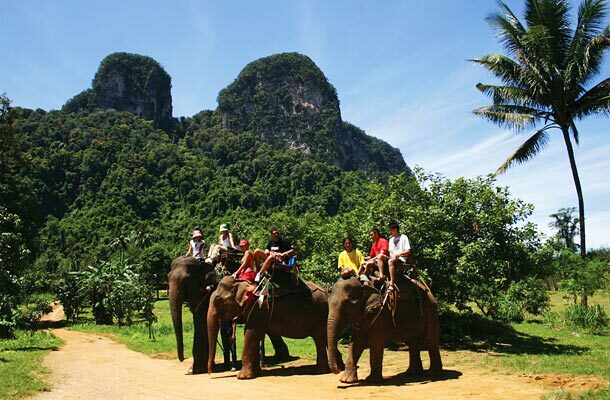 Whether you want to go elephant trekking through the jungles of Thailand or simply have your picture taken next to one, the opportunity to do so will undoubtedly avail itself in Thailand. One of the better places to see entire troops of elephants in a natural habitat is in the north of Thailand near Chiang Mai. Here there are many elephant camps where these regal and majestic animals are looked after while they can still be seen by tourists. Another interesting place to visit in Thailand if you are interested in Elephants is the young elephant training centre situated in Lampang which is also in the north of Thailand about 100 km south of Chiang Mai. Here you will see how the elephants are trained to obey common commands from their human trainers such is kneeling, standing on two legs and picking things up with their trunks. Most tourist resort areas in Thailand including Phuket and Pattaya will have some kind of elephant riding attraction on offer. Riding an elephant through a dirt trail in the greenery of Thai woodlands is a pleasant way to pass an hour or so and a sure way to please the children. Elephants are saddled and can carry up to two or three passengers depending on size. Of course, all elephants should be accompanied by a trained elephant handler throughout the duration of your ride. Elephants in Thailand are commonly used as a way to make a quick profit from tourists. Usually a baby elephant is paraded around a touristy area in a major city and tourists are charged a small amount to have their picture taken with the elephant or to feed the elephant some sugar cane. While this probably isn’t dangerous it may be encouraging a practice in which the elephants’ best interests are not considered by the handlers.